English is written left to right. 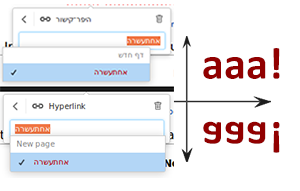 Hebrew is written right to left. We know that. Browsers (for the most part) know that too, just like they know that the default directionality of a web page is left-to-right (LTR), and that if there is a setting that explicitly defines the direction to right-to-left, the page should flip like a mirror. Browsers are smart like that. Mostly. But even browsers have problems when deciding what to do when languages are mixed up, and that, my friends, is a recipe for really weird issues when typing and viewing bidirectional text. I sit in front of my trusty computer, coding-away right-to-left popup-location fixes in anticipation of the new VisualEditor deployment in the Hebrew Wikipedia. The hard part, I tell myself (and with good reason) is calculating the mirroring coordinates; which object to I use as parent to mirror my coordinates against? I’ve spent a lot of my Physics education dealing with calculations. Calculating positions of objects as they move in space, particles in some electric field, planets around a certain star, and more, more and some more. In Physics, Mathematics is the language we use to represent reality, perform predictions, and validate them.